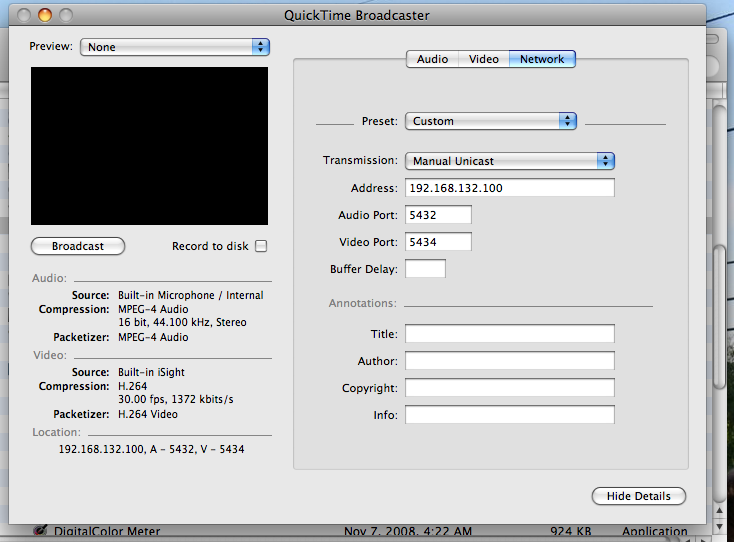 The first step is to install QuickTime Broadcaster. It doesn't have a lot of requirements so it should work on most macs. The QuickTime Broadcaster will be the source of the video and the destination of the video in my case is a second machine with VLC installed on it although you could run VLC on the source machine if you wanted to. An important note at this point is to make sure the destination machine doesn't have a firewall turned on or if it does that it isn't blocking ports 5432 and 5434. Now the configuration is ready and it is time to create an export for use in VLC. To export go to File -> Export -> SDP menu option. For this example I'm calling the file stream01.sdp. Once the SDP file is on the destination machine you can start VLC and open it. In VLC go to File -> Open File then select the SDP file that was exported earlier. VLC is now ready to stream from QuickTime Broadcaster. In QuickTime Broadcaster click the Broadcast button and then in VLC click the play button. At this point you should start seeing the stream in VLC. The order you start broadcasting between QuickTime Broadcaster and VLC doesn't seem to matter. There were a few times that I had VLC start for a second then freeze but I was using a wireless network so I'll blame that for the freezes. In general it worked well once it was all set up. This is actually what I would call re-streaming since my need is to get the iSight stream to FFMpeg. In the perfect world I would be able to stream directly from QuickTime Broadcaster to FFMpeg but the limitations of QuickTime Broadcaster don't allow that to happen, at least from what I could find. Enter the SDP file in the file window and hit the Stream button. Select "Display locally" if you want to see the video as it is re-streamed. Select HTTP from the "New destination" drop down list and click the Add button. I have picked HTTP here because it is what works the best for me but there are other options you can use if you want to try different streaming protocols. I was able to leave the defaults as they were for the HTTP stream. Click the Stream button at the bottom to start streaming. I have a post ready on how to do live streaming using a modified version of the segmenter. It seems to work pretty well for me but I haven't pushed it real hard. I'm going to get it out there and let others hammer on it. I hope the configuration is understandable, it can be tightened up a good bit but at this point I lack the time to do that so I'm just going to go with what I have to help move people forward. 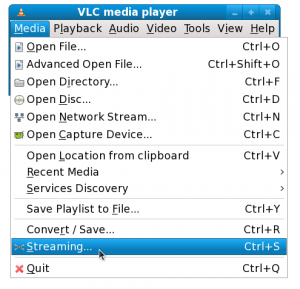 Quick heads up about VLC 1.0.0. It can open the iSight its self. Just pick File->Open Capture Device and then Pick iSight from the drop down. The dialog says it does 640×480 only, but I so far only get a little 160×120. But more then enough to test with. Unfortunately the isight only streams the video in VLC 1.0 and not audio. I'm having a little issue making this all work on only Mac hardware. The option for streaming is only set to mpeg-ts which I would rather have VLC send out RAW from the Quicktime Broadcaster and let ffmpeg deal with the conversion to mpeg-ts. Anyone else have a good solution for streaming from an external camera? Carson help! I need a lot of education. Do I need both RED5 and FFMPEG to do the intended live broadcasting and ondemand streaming on my website? Can I use just FFMPEG? Please share. Hi, I want to mention, that erlyvideo can accept video stream from Quicktime Broadcaster and retransmit it to flash clients.